^ "'Crocus sativus L.". Tropicos. Missouri Botanical Garden. Retrieved 2012年8月3日. ^ Grigg 1974, p. 287. ^ a b Hill 2004, p. 272. ^ McGee 2004, p. 422. ^ a b c Negbi 1999, p. 1. ^ a b c d e Kafi et al. 2006, p. 23. ^ a b Rau 1969, p. 53. ^ a b c Rubio-Moraga et al. 2009. ^ a b 小野 1806. ^ a b c d Deo 2003, p. 1. ^ Negbi 1999, p. 28. ^ a b Caiola 2003, p. 1. ^ Negbi 1999, p. 30-31. ^ Willard 2002, p. 3. ^ Government of Tasmania 2005. ^ Willard 2002, pp. 2–3. ^ Deo 2003, p. 4. ^ Verma & Middha 2010, p. 1–2. ^ Hill 2004, p. 274. ^ a b Kafi, et al 2018. 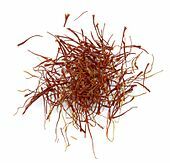 ^ “Saffron: Style, Science & Sustenance” (英語). Verve Magazine: 9-10. (2017-06-60). http://vervemagazine.co.nz/saffron-style-science-sustenance/ 2018年10月7日閲覧。. ^ “2018 Inspire+ NZ Artisan Awards: NZ Artisan Award finalists announced ! [NZ Artisan Award 最終選考発表”] (英語). Supermarket News (Review Publishing Co Ltd). (2018年9月4日). http://supermarketnews.co.nz/artisan-award-finalists-announced-2/ 2018年10月7日閲覧。. ^ Willard 2002, pp. 102–104. ^ Australian Broadcasting Corp. 2003. ^ García-Rodríguez et al. 2016. ^ Moras et al 2018. ^ a b 国立健康・栄養研究所 2007. ^ Foe et al. 1997. “Avoid food poisoning these holidays— TOP 5 FOOD FRAUD PRODUCTS*: Milk, Olive oil, Honey, Saffron, Fish　[食中毒予防：最も産地偽装・偽造されやすい食品5つというと牛乳、オリーブ油、蜂蜜、サフラン、魚介類”] (英語) (pdf). ISO Focus (ISO). (2013). https://www.iso.org/files/live/sites/isoorg/files/news/magazine/ISOfocus%20(2013-NOW)/en/2017/ISOfocus_121/ISOfocus_121_EN.pdf 2018年10月7日閲覧。. García-Rodríguez, MV; López-Córcoles, H; Alonso GL; Pappas CS; Polissiou, MG; Tarantilis PA (2016-11). “Comparative evaluation of an ISO 3632 method and an HPLC-DAD method for safranal quantity determination in saffron” (英語). Food Chem 15 (221): 838-843. doi:10.1016/j.foodchem.2016.11.089. PMID 27979282. Moras, B; Loffredo, L; Rey, S (2018-08). “Quality assessment of saffron (Crocus sativus L.) extracts via UHPLC-DAD-MS analysis and detection of adulteration using gardenia fruit extract (Gardenia jasminoides Ellis)[サフランの品質検査におけるUHPLC-DAD-MS分析法とクチナシ抽出物による偽造の判定]” (英語). Food Chem 15 (257): 325-332. doi:10.1016/j.foodchem.2018.03.025. PMID 29622218. Kafi, M; Kamili, A.N; Husaini, A.M; Ozturk M; Altay, V (2018). 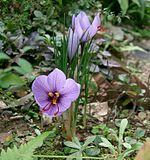 An Expensive Spice Saffron (Crocus sativus L.): A Case Study from Kashmir, Iran, and Turkey [サフランという高価なスパイス：カシミール、イラン、トルコにおける事例研究]. Hakeem, K.; Ashraf, M.; Ahmad M. [eds]. (英語). Global Perspectives on Underutilized Crops (Springer, Cham). doi:10.1007/978-3-319-77776-4_4. ISBN 978-3-319-77775-7.